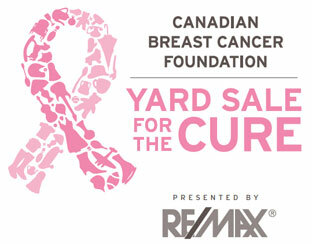 Ben Sage - Moving Woodstock: Yard Sale for the Cure 2012 COMING SOON! If you're anything like me, you've started (or are at least THINKING about starting) your spring cleanup. Sorting through stuff that's been hanging around for a while, thinking of what to get rid of and what to hang on to for another year. I'd like to ask that as you're cleaning / tidying for spring, if you'd think about me, and the annual commitment that my brokerage undertakes to raise money for the Canadian Breast Cancer Foundation. Every year, the Realtors at my office pool their resources and throw a huge Yard Sale! This year, the event will be on Saturday, May 26, 2012. Venue not yet confirmed. We will be having Drop off Days in the coming months, so stay tuned to this space for more information on those dates and locations. What we need is gently used items of reasonable value to sell at the yard sale! Unfortunately we can't take large appliances, large furniture, clothing, or old electronics. Anything else is fair game!!! Please set aside any items of value, and either bring them to a drop off location, or give me a shout, and I'll happily come and pick up the stuff!